The symbol of the United States democracy, Mount Rushmore appeared on the stamp for the first time in 1953. In 1974, an airmail stamp was issued as a part of the increasing international rate for letters and letter package. 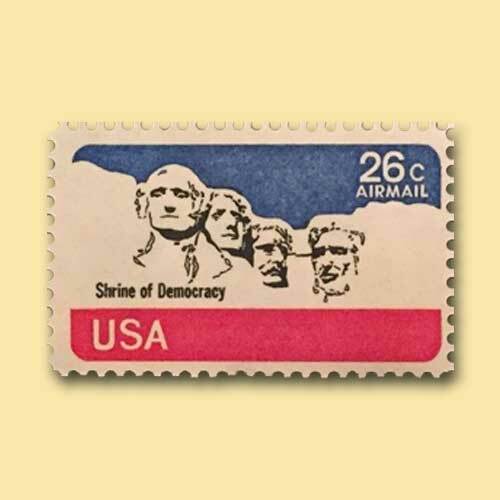 This airmail stamp was from Mystic Stamp Company, there are only four occasions were the Mount Rushmore appeared on the stamps since 1953. One example is the above-shown stamp, this stamp also helped to increase 26 per half an ounce for all destinations in the world. The other stamp depicted this symbolic mountain were issued in 1991 and 2008.